The eel which came second to last, had the lightest touch of wasabi between the fish and the rice. In one fluid motion, Jiro painted it with the sauce and put the sushi down in front of me. 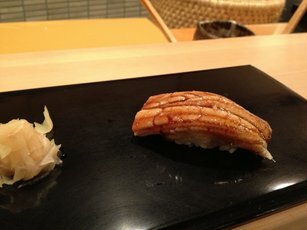 Eel is one of my favorite sushi dishes and I had never tasted anything like this eel before. I love sushi. So it wasn't any surprise that I, along with millions of other sushi lovers around the world, gobbled up the film Jiro Dreams of Sushi when it was released in 2011. The film tells the story of Jiro Ono, an 88-year-old sushi master who is considered by many to be the best sushi chef in the world. He runs a small sushi restaurant inside Tokyo's Ginza Subway Station called Sukiyabashi Jiro, the only sushi restaurant in the world to receive three Michelin Stars. In addition to telling Jiro's story, the film arguably features some of the most beautiful and mouth-watering depictions of sushi ever seen on film. (If you watch the film, I recommend having sushi nearby.) So when I was invited to go Japan recently on a speaking tour, I eagerly called up my hotel and asked if they could make a reservation. After many attempts -- the restaurant's phone line is only open a few hours a day, frequently it's busy or no one picks up -- they were finally able to get me a reservation for my first day in Tokyo. It took me a little while to find the restaurant inside the massive Ginza subway station, it has dozens of high-quality restaurants, boutiques, shops, and more. With one nondescript sign on the door, most people pass by without ever knowing what's inside. As soon as I walked in, a man ushered me to my seat, the menu was set and laid before me, with nineteen items on it. I was sitting with just four other people at the sushi bar, and I was very fortunate to be seated directly in front of Jiro. I could watch him work and prepare each piece. He has two other assistants, one of whom is his son, but Jiro is clearly in control of every aspect of the kitchen. Jiro laid my first piece of sushi down in front of me. It was squid, one of my favorites. Determined to savor every moment of this meal as much as possible, I bit into the squid, putting half back on my plate. The texture was smooth and soft with just the right amount of chewiness to it. I instantly concluded this was the best squid I'd ever eaten. Just as I proceeded to the second bite, Jiro said to me in Japanese, "One bite please!" In most restaurants I probably would have snapped back at anyone who told me I was eating a piece of food the wrong way. But when Jiro gave me this instruction I instantly recoiled, as if I had broken a sacred covenant, apologized and took pains to avoid repeating this unforgivable mistake throughout the rest of the meal. Next up was an absolutely delicious piece of yellow tail. Following that was the smelt roe, which I normally avoid at all costs when at an ordinary sushi restaurant but here it was heavenly. The abalone literally melted like butter in my mouth. I kept looking at my menu anxiously assuring myself that there still much more to come. In between courses, I watched Jiro intently, as he crafted each piece of sushi with precision and technique of a sculptor. He molded the rice with his bare hands into a tightly condensed and perfectly shaped rectangle. Like a painter, he would take a brush and paint the fish with one incredibly light coat of sauce. 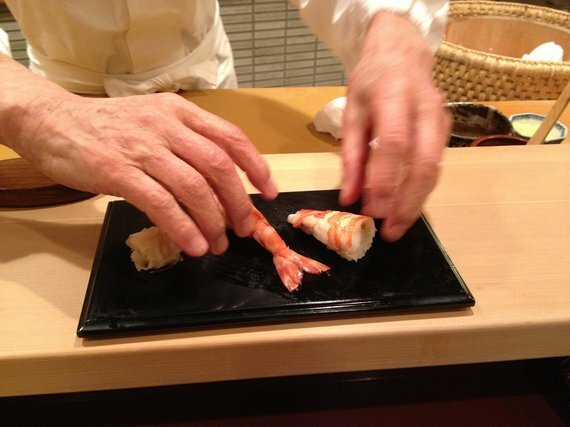 He was a culinary artist and each piece of sushi was a masterpiece. During that course, I realized why Jiro's sushi is so good. Everything Jiro does to each dish is dynamically designed to highlight and bring out the flavor of the fish. Jiro has an excellent ability to select the finest quality fish from Tokyo's legendary Tsukiji fish market, and the fish are the secret ingredients in each dish, hidden in plain sight. The wasabi, sauce, and rice, all function as arrows pointing towards the fish, making it the center of attention, everything is designed to allow the diners to taste the flavor of the fish. Given that the fish is the one ingredient least in the chef's control, such an approach takes true humility and grace. 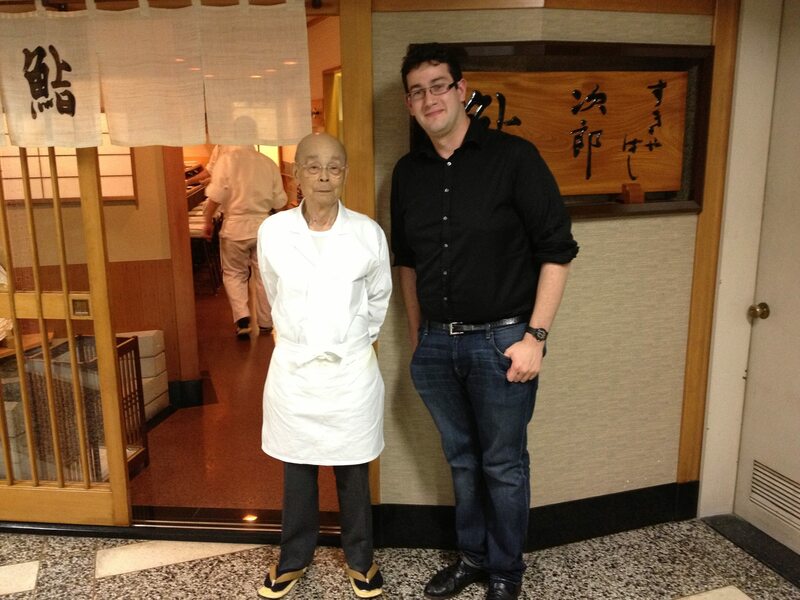 And you would be hard-pressed to meet a chef as humble or as graceful as Jiro. The final course was egg, which was so perfectly done that it ranked among the best bread puddings I've ever had, the combination of sweet and savory. For dessert, there was crescent slice Japanese winter melon, which is essentially a very high-end cantaloupe. Like the rest of the meal, it was elegant in its simplicity. 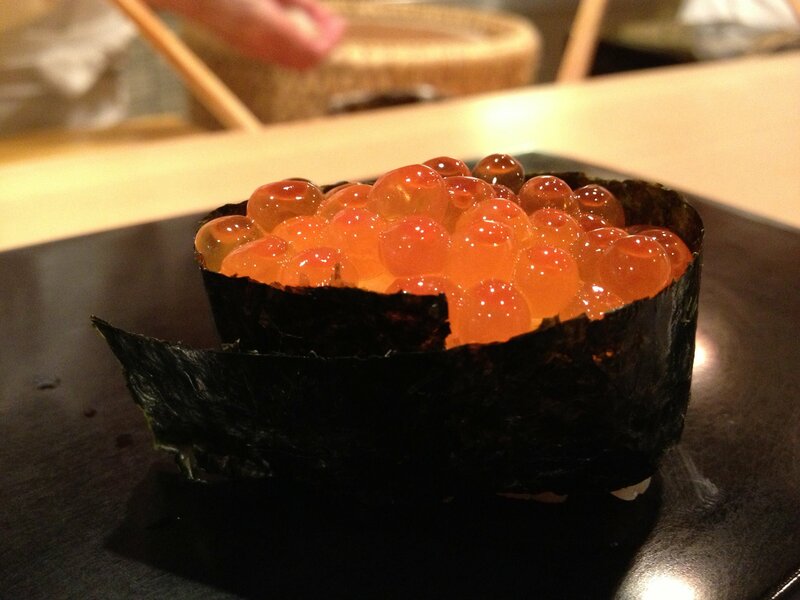 With the attention Jiro Dreams of Sushi received, it would be easy for Jiro to fly around the world hawking products, opening restaurants, and film a show for The Food Network. But clearly he's not interested in becoming a personality. He is a chef, and while he is in some senses a "celebrity chef," he has almost never missed a day of work. However, he has begrudgingly accepted his fame, at the conclusion of the meal he offered to sign our menus and take pictures with each diner. Usually when I eat a great meal, I come away thinking about how great the meal was, talking about it with my friends, and looking at pictures I took during the meal. But the reflection period typically ends there. My meal at Jiro's was different. I actually came away with a true appreciation of sushi-making as an art form in part because I could watch the process right in front of me and understand how much artistry was involved. Some reports of meals at Jiro's have suggested that the experience is impersonal and that there is not the kind of service that usually accompanies such an expensive meal. What I think that is mistaken for is the fact that Jiro does not care deeply about how full the restaurant is, or if diners are entertained. He cares that the food is good, something that he happily leaves up to the diners, much in the same way that a great painter doesn't paint to make money, achieve fame, or to please the public. And like most people with so much passion and supreme talent for what they do, Jiro has achieved all those things anyway.